Do you need topsoil this spring? Call Lehnhoff’s Supply! Topsoil is usually considered to be the topmost layer of soil, but it also the layer of soil where most of the growing action occurs. Most property already has topsoil, but sometimes you may need more, such as when you need to fill a low spot, backfill construction areas, or build up raised beds. When you decide that you need to add additional topsoil to your property, you can often purchase it at nurseries or garden centers. Topsoil is not potting soil or garden soil, but it does contain organic matter that gives it a rich, often dark, color. If you’re looking to buy topsoil for your property, here are some things you should consider. Most nurseries can provide quality topsoil because it is a huge part of their business and reputation. Look up the nursery or business and read the reviews to make sure people are happy with the topsoil they’ve purchased. Be careful buying it from construction sites or private sellers, as it may be full of rocks, debris, and weeds that you need to sift out before you can use it. 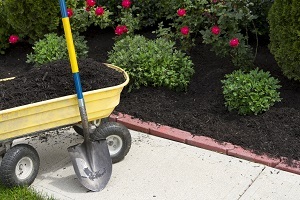 Some nurseries and companies also offer soil mixes that have organic matter and other material like sand pre-mixed in, which could save you time in the long run. Most nurseries and garden stores sell it by the bag, which is fine for small projects, but very expensive if you need a lot. For bigger projects, consider getting a delivery of soil from a specialized provider. What Properties Does The Soil Have? Your provider should be able to tell you basic things about the soil, such as the pH (most plants prefer a pH of 6.2-6.8), the percentage of organic matter, and physical properties (sandy soil, clay soil, etc). Ask them about the soil and let them know what you’re looking for before you commit to a purchase. Before investing in soil, figure out if the soil you already have really isn’t meeting your needs or if you could augment it. Perhaps you just need additional organic matter, like compost, tilled into what you already have. If you have a low spot to fill, is there also a high-spot that needs to be graded down that you could fill from? Buying soil is an investment, so be sure it is the right choice before you do it. This entry was posted on Friday, March 22nd, 2019 at 4:38 pm. Both comments and pings are currently closed.